R scripts for running the GLMMs for the fine-scale analysis of the effect of water body characteristics on bat activity, species richness and the activity of the three potentially competing Pipistrellus species. Species distribution modelling (Maxent) outputs for all desert bats. Aim: Desert ecosystems, with their harsh environmental conditions, hold the key to understanding the responses of biodiversity to climate change. As desert community structure is influenced by processes acting at different spatial scales, studies combining multiple scales are essential for understanding the conservation requirements of desert biota. We investigated the role of environmental variables and biotic interactions in shaping broad and fine-scale patterns of diversity and distribution of bats in arid environments to understand how the expansion of nondesert species can affect the long-term conservation of desert biodiversity. Location: Levant, Eastern Mediterranean. 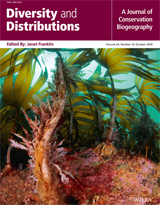 Methods: We combine species distribution modelling and niche overlap statistics with a statistical model selection approach to integrate interspecific interactions into broadscale distribution models and fine-scale analysis of ecological requirements. We focus on competition between desert bats and mesic species that recently expanded their distribution into arid environment following anthropogenic land-use changes. Results: We show that both climate and water availability limit bat distributions and diversity across spatial scales. The broadscale distribution of bats was determined by proximity to water and high temperatures, although the latter did not affect the distribution of mesic species. At the fine-scale, high levels of bat activity and diversity were associated with increased water availability and warmer periods. Desert species were strongly associated with warmer and drier desert types. Range and niche overlap were high among potential competitors, but coexistence was facilitated through fine-scale spatial partitioning of water resources. Main conclusions: Adaptations to drier and warmer conditions allow desert-obligate species to prevail in more arid environments. However, this competitive advantage may disappear as anthropogenic activities encroach further into desert habitats. We conclude that reduced water availability in arid environments under future climate change projections pose a major threat to desert wildlife because it can affect survival and reproductive success and may increase competition over remaining water resources.